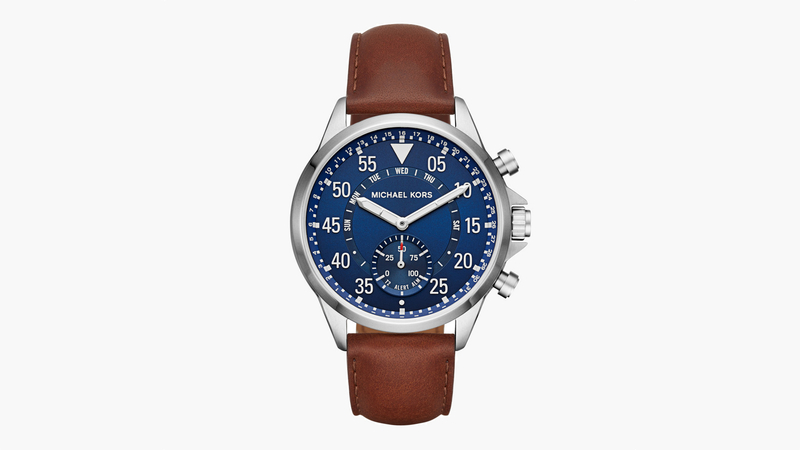 Following the launch of the Michael Kors Access Sofie and Grayson Android Wear watches at Baselworld, the fashion house has announced that it will be making every single new men's watch style in its collection connected. That means that no matter what your favourite MK 'dumb' watch is, soon you'll be able to buy a smart version of it. "All of our new men's watches that are introduced from Fall 2017 going forward will have some form of smartwatch technology," said John D. Idol, CEO of Michael Kors. "We believe in hybrids as part of our future for men and will be launching three new men's hybrid styles this Fall." This means future Michael Kors watches will become hybrid smartwatches with analogue watch faces and features including activity tracking, smartphone alert vibrations and functions for the side buttons (remote selfies, find-my-phone and music playback controls). Of course, Michael Kors is planning more display smartwatches too but we'd wager far fewer than new hybrid designs. Michael Kors also launched a whole range of both men's and women's hybrid smartwatches at Basel this week including the Gage (pictured), as part of the Fossil Group's big splashy wearable tech slate for 2017. The aim is to launch 300 wearables across all its licensed brands and fashion labels by the end of the year. We've seen six new MK hybrids so far and the brand also signalled that it will be announcing more men's hybrid watches this fall. Elsewhere, Fossil Group unveiled the new Fossil Q Venture and Q Explorist, Diesel On and Emporio Armani Connected smartwatches, all running Android Wear 2.0. Plus too many hybrids to count from all manner of designer names: Marc Jacobs Relic, DKNY Minute, Tory Burch Collins, Kate Spade, Skagen, Chaps, Relic and Michele. Correction: An earlier version of this story reported that all Michael Kors watch styles will get smart editions.